Solar Rebates Make Solar Energy Affordable! Solar Energy systems pay for themselves and much more by reducing or eliminating your electricity bill. Yet we understand that the start up cost of a solar system can be a large investment for families today, even with great long-term savings. Your utility company and the government also understand, which is why they offer huge rebates and incentives to help you help them go solar by putting money back in your pocket quickly. California Solar Engineering will not only work hard to get you the most incentive money possible but we will also present you with financing options that help you start saving today! The 30% federal tax credit for solar energy greatly reduces the total cost of solar. A tax credit is not a simple tax deduction. It is a credit that is applied directly against what you owe in taxes. Solar energy incentives and rebates on the installation of both business and residential solar (PV) systems to reduce our country's dependence on foreign fossil fuels. To stimulate alternative energy sources, like solar electric, the Emergency Economic Stabilization Act of 2008 (P.L. 110-343) was signed into law on October 8th, 2008. This law provides a number of tax incentives, including credits and accelerated depreciation on solar energy systems, designed to encourage both individuals and businesses to make investments in renewable energy. For businesses: the business solar investment tax credit (ITC) received an 8-year extension. Previously this important incentive was renewed for only 2 years at a time. For home owners: the Personal Tax Credit (PTC) was greatly improved--the $2,000 cap for residential solar was lifted. Even modest residential solar installations will be positively affected by the lifting of this $2,000 cap. More solar power will move the United States toward energy independence, tackling climate change in a serious, sustainable way. Installing solar panels on your home or business will also provide long term savings from rising energy costs. Get Started Today - Call us at 888-62 SOLAR (76527) or Click to Get a Quote. Savings on solar systems aren't limited to federal tax credits. In addition to the 30% Federal Tax Credit, all Southern California residents are eligible for a solar rebate from their local electrical utility. 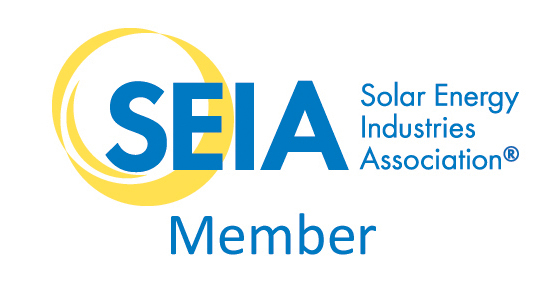 California Solar Engineering (CSE) will guide you through the rebate application process so that you will be eligible for the maximum rebate possible for your solar energy system. We understand exactly how to apply on your behalf for the greatest rebate that you are entitled to. California Solar Engineering works with each utility company in Los Angeles and throughout Southern California on a daily basis. We fill out your solar rebate paperwork for you. 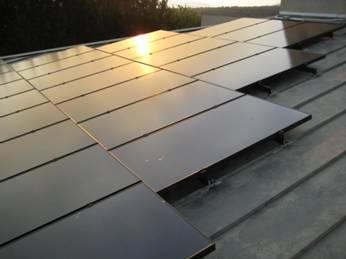 STEP 1 - The rebate process begins when California Solar Engineering fills out your Rebate Request form which tells your utility company exactly what equipment we will use to build your solar system and how it will be installed. We have never had solar rebate application rejected. STEP 2 - Waiting for your rebate to be processed is the most lengthy part of getting a solar system. Utilities take anywhere from 4 to 10 weeks to process the solar rebate application. The installation may take place during this interval but some clients prefer to wait. STEP 3 - Installation of your solar electric system! This can take from 3-10 working days depending on the size of your system. STEP 4 - Inspection by the local Building and Safety Department to confirm that the installation adheres to the appropriate building codes. STEP 5 - Your PV system will be inspected by the rebate office of your utility. They will confirm that the PV modules, inverter and system orientation agrees with the original solar rebate application. STEP 6 - After these two inspections someone from your utility company will be out to install a net meter. At this point you will stop paying so much for electricity! However, there is an additional 4-10 week wait for your rebate check to be processed and mailed to you. Payback All local utility rebates are processed on a first come first served basis, and are paid by check. We will process your rebate application and inspection requests on your behalf to make the rebate process easy! Don't wait - Local utility rebates continue to go down over time! The California Solar Initiative ($3.2 billion California is investing in solar through incentives) is tiered to get a certain number of people to go solar. Once certain benchmarks are met, the incentives decrease by 10-15%. So, if you are interested in going solar, but you find yourself hesitating, remember that the rebates are not going to get any higher, only lower. Please call us at 888-62-SOLAR to find out what your utility rebate currently is. Los Angeles Department of Water and Power (LADWP) offers a substantial rebate, up to 40%, for installing residential solar. As of July 1st, 2009 LADWP switched to a tiered rate structure as well. Where residential electricity from LADWP used to cost $0.13/kWh, it can now increase to as much as $0.34/kWh for electricity in the highest tier, Tier 3. 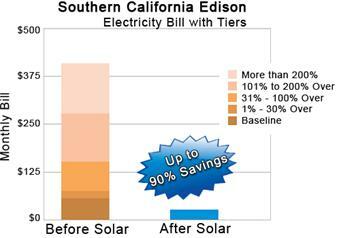 Southern California Edison (SCE) offers the lowest rebate level in the area approximately 20% of your total system cost. On the other hand, SCE customers have to deal with a multi-tiered rate structure that costs them more money towards the end of their billing cycle--up to $0.34/kWh(kilowatt-hour)! Therefore, SCE customers will greatly benefit from installing a solar electric system on their home or business as it will eliminate their most expensive electricity. SCE customers will see the same payback rate as other Southern California residents. Other municipally-owned utilities in Southern California such as Burbank, Glendale, Riverside, Arcadia and Pasadena offer rebates that fall within these two extremes. Electric rates also vary from utility to utility. Customers receiving rebates and federal tax credits for their solar system will generally see a payback usually in 9 years or less. More questions? This can be confusing and changes frequently. We would love to explain the most up to date status of all the different rebates and incentives, just contact us, call 888-62-SOLAR, or simply answer the following 4 questions!